View Poll Results: What are your top 4 scouts for future series ? Thread: What're Your Favourite Scouts for Future Series ? This one's for Mike ! Last edited by flash; 11-08-2018 at 12:19. I voted but the results of the poll are hidden. Is that how it should be? Not sure Gary. I could see the result after I voted but it could just be because I'm an administrator. Voted here also and results are hidden. You need FE2's on that list came in as a fight scouts first. Last edited by Mike George; 11-08-2018 at 13:51. Not sure how to vote on this. I would be going by other posters' opinions, and not necessarily from any personal passion. Early and Early-Mid war are the areas I see as lacking in options for campaigns. For numbers, on the Entente side, I would like to see the Sopwith Pup, but lots of the other names are not known to me. What cards have I done up would be my next selection criteria, and many of the above are, again, not on my list. SPAD XII for the cannon equipped plane, but this would be a fringe choice, not necessarily based on numbers in operation. The Late war planes I've done cards for, but there are already lots of choices for that period. Not a "scout", being a two-seater, so it wouldn't appear on this list. PS: The one seat "scout' or two seat 'two-seater' designation is a Wings of War/Glory distiction, and not a role/type designation. 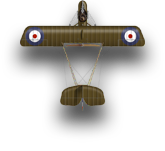 The Bristol Fighter is not classified as a 'scout' in WoG. Last edited by OldGuy59; 11-08-2018 at 14:02. Guess that answers that then Ken, as I can still see it. I only miss the Sopwith Pub. Results are hidden, my bad, I was hoping to get a true result without influence; machines not known are easily researched. Pups and Rolands for me. As with the other polls, I have already filled my requirements for all of these planes via Shapeways, but I have voted for 4 which would provide a wide range of repaint options. Sopwith Pup tops the poll by a long way, Pfalz D.XII & Dolphin are next with the Bristol Scout & Roland D.VI tied for fourth. I'd be happy with any of them in the next new release if there is one. The Siemens-Schukert D.I., Junkers D.I, and Sopwith Baby were not included.